No, I’ve not yet mapped out a 5 year plan, but I have been trying to follow a detailed daily schedule a la Ben Franklin. Generally, I like it. 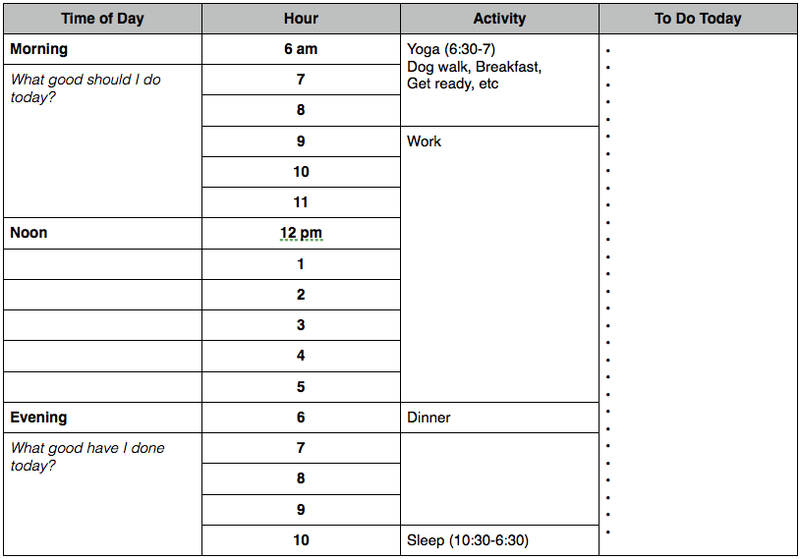 I find it useful to organize what I need to get done in a day. I incorporated my mom’s suggestion of crossing things out that aren’t that important (sometimes I’m a bit ambitious with my time). The schedule is an effective motivator–I don’t want to see the same tasks on my list every day! The “greater good” question (in the left column) is still a work in progress for me. I find for where I am now in my life, it feels a bit high-minded. I’m not President or writing a declaration of independence, so my world is a little smaller at the moment than Mr. Franklin’s may have been. I also think that asking yourself this question every day is a powerful reminder that no matter what you’re doing, it’s always important to do your best at it. I’m grateful for my job and even if it’s not what I will do for my entire life, I still need to work my hardest at it (just like the bus driver my mom told me about). I love the idea of ‘what good should I do’ and ‘what good did I do’ today. I will certainly take your template out for a spin – as I’ve been working on different ways to effectively block my time. My current struggle is ‘Mikey & me time’. One of my favorite sayings is ‘work expands to the time allotted’ -and I’ve made the promise to myself and to Michael to better manage this. I think it’s unfortunately very common for driven and successful people to neglect or take for granted their personal relationships in the midst of cultivating professional ones. (not that you are doing this–I’m just generalizing here). It’s great to remember that those personal relationships are every bit as important to our overall success and happiness as the professional/business related issues are. I think we really recognized that we wanted to prioritize our family life when we closed the store. As hard as that decision was, we do feel it was the right one and are enjoying all of our family time now!